Myth: This gun safe is has a UL fire rating. This is false, unless you’re looking at a true safe. There are a few ways that gun safe manufactures may try to confuse you about this. When gun safe companies mention an Underwriters Laboratories rating, the rating usually applies to something other than the safe’s Fire Endurance. There are over 19,000 UL product ratings for everything from batteries to outdoor decks to Christmas lights to gypsum drywall (Sheetrock). The manufacturers play on this confusion. What exactly is UL rated about the gun safe? “UL Rated Fire Insulation” – This is the most common misleading claim. Gypsum drywall has plenty of UL ratings including UL 100 Standard for Sustainability for Gypsum Boards and Panels and U419 for Fire Rated Assemblies/Wall and Partitions Systems. Your coat closet has a lining of UL Listed gypsum drywall (Sheetrock). Would you say your coat closet is fireproof? Just because the drywall is UL Listed for use in an office building doesn’t mean your safe is fire rated. Upper end gun safes may use other fire insulation like ceramic fiberboard or fiberglass. These linings may have their own UL rating too. These linings are generally better than gypsum drywall, but unless it was successfully UL 72 tested, the actual Fire Endurance of the gun safe hasn’t been verified. The gun safe itself is a UL Listed Residential Security Container (RSC). This is the lowest UL security test level for protection against basic hand tools, but doesn’t test fire endurance at all. More information about this security rating can be found in my gun safe burglary protection article. UL Listed Lock. The lock may be “UL Group 2”, listed under UL 768 Standard for Combination Locks or another standard. These ratings are very important and I’ll talk more about these in What to Look for in a Gun Safe, but they only cover the lock. UL Listed Extension Cord. I haven’t seen this claim yet, but the power extension cord installed in your gun safe may be UL Listed. “Tested to UL standards” – This could mean almost anything. On a higher end commercial safe it could mean that the company paid for a UL 72 testing but failed for some reason. They may have corrected the issue or not, but elected not to pay again to retest it. Or it could mean that a gun safe manufacturer came up with their own fire rating test based on their interpretation of UL 72, in which case it means nothing. You can check the difficult to use UL Certification Database to see if your safe has a UL 72 fire rating, but the odds are almost zero that it does. If it does, it should have a label which says something like “Record Protection Equipment – Classified By – Underwriters Laboratories, Inc – As To Fire Resistance – Rating: Class 350 – 2 Hr“. UL 72 formerly used letters for test classes (Class B, etc.) instead of numbers (350, 150, 125), so older fire safes may have this notation. Myth: Fire is a bigger risk to my guns than Theft. It depends where you live, but statistically this is just plain wrong. I saw one gun safe review website which made this statement after comparing the FBI robbery crime data to the number of home fires. (Robbery is committing theft by using the threat of violence against the victim, the victim must be present at the time. Burglary is breaking into a place with the intent of committing a crime, when the victim is not present.) I covered burglary in more detail in the previous article. You can expect 5 home fires (1 every 15 years) of varying sizes in your household in an average lifetime. Most of these will result in little or no damage and not be reported to the fire department. The odds that your household will have a reported home fire in an average lifetime are 1 in 4. This is a fire large enough to call the fire department. Due to the relative risk of fire compared to burglary, and the difficulty and cost of getting decent fire protection in a gun safe, many gun owners decide to skip fireproofing and get a gun safe with better burglary protection. Some take other cheaper steps for fire protection, like installing a sprinkler over their gun safe or adding fireproofing themselves. The level of risk you’re comfortable with is up to you and your budget. Let’s assess your risk of fire. Home fire risk factors are analyzed by FEMA’s US Fire Administration (USFA), the NFPA, and the Insurance Services Office (ISO). The ISO services the insurance industry, including writing underwriting guidelines for homeowners insurance. Geographic region – the Midwest has the highest rate of fire per person. The West has the lowest. Long distance to fire department – closer is better. Limited fire department and dispatch capability – ISO assigns fire departments Public Protection Classification (PPC) Class from 1 to 10 for use by insurance companies. Class 1 is the highest protection and Class 10 the lowest. 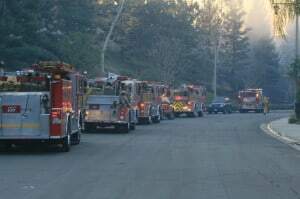 Your fire department may publish this online, like Evergreen, CO, or you can ask your insurance company or fire department what their PPC Class is. Limited water availability – a hydrant close by with high water pressure is best. The distance to and pressure of the nearest hydrant are factored by your insurance. Mine was checking online with StreetView while I was on the phone for a quote. Draft sources such as open water or pumps can be used, but raise your risk over a hydrant. Arson rate in the area – arson is the third leading cause of home fires. High vacancy – vacant structures are more likely to experience arson. Also people may break into and live in abandoned structures, light fires to stay warm, and be under the influence of alcohol and drugs. Neighborhood decline – declining neighborhoods and property values can discourage owners from investing in maintaining their properties. This includes the fire-critical heating and electrical systems. Family stability – fire rates are 2 to 4 times higher in areas with low family stability. Lower income levels – lower income neighborhoods statistically have more fires. Housing affordability – neighborhoods with high rent and mortgage payment burdens have a higher fire risk. This is probably because the residents can’t afford maintenance, fire protection devices, and may have their gas or electricity shut off and use space heaters to keep warm. Difficult to access home – these mostly applies to rural homes. Natural fuel near house – dead vegetation, heavy conifers and hardwoods, tall thick grasses, small trees, and other fuels within 300 feet of your home raise your risk. High lightning and/or wind area – lightning causes fire. Winds spread fire more quickly, make it harder to put out, and spread wild fire. Above ground electrical utilities – buried power lines are lower fire risk, especially for rural homes where tree branches may fall on power lines. Steep property slope – makes fire fighting more difficult and provide more oxygen to a fire. Hillside houses may also have stilts which can raise risk if not enclosed. House age – the property age is a factor in home fires, especially for homes built before 1940. Older heating systems – Heating systems are the second highest cause of unintentional fires. Home age correlates to the age and type of heating system. Older homes often have inadequate heating systems and insulation, which may encourage the use of space heaters. Older electrical systems – Electrical fires are the third highest cause of unintentional home fires. 63% of electrical fires are caused by wiring and related equipment. Older electrical systems were not designed to support the loads of modern appliances and devices and lack modern safety features. Heating type – the age and type of heating system has an effect on fire risk. Despite the more moderate climate, heating equipment is a bigger risk in the South than the North. Fewer Southern households have central heating. These homes instead use less fire-safe methods such as room heaters, fireplaces, portable heaters, and wood stoves. Open flame cooking apparatus – cooking is leading cause of home fires. In over half of cooking fires oil, fat, or grease is ignited. Gas stoves and others with open flames are higher risk. No smoke detectors – houses with smoke detectors have lower fire risk. Possibly the residents are more safety conscious, live in newer structures maintained to building codes, or have a higher income to afford batteries and detectors. No fire extinguisher – The majority of home fires are put out before the fire department is called. Having a home fire extinguisher that was bought or charged within the last 5 years reduces your risk of having a serious fire. No fire suppression – sprinkler systems are still rare in single family homes. Many apartments and condos have them. No security system – some monitored alarm systems are linked to the fire department. 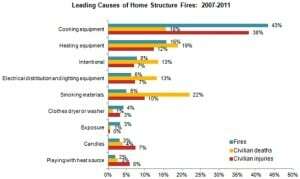 Wood decks and siding – decks and siding made of combustible materials increase risk. Wood frame construction– wood frame is the highest risk construction, followed by masonry, and fire restive types. Cedar shingle roof – untreated wood shake roofs have the highest risk, followed by treated wood shake, moss/needle-covered asphalt, asphalt, and metal or tile roofs. Unenclosed features – unenclosed eaves, balconies, decks, stilts, etc. Unscreened chimney – can allow wood stove embers to blow out the chimney and start a fire on the roof or nearby vegetation. Adherence to building codes – rural and self-built structures are more likely to use low-cost building designs and materials that may not meet customary building codes. Of course many homes which meet code aren’t built very well these days, but you get the point. Minimal defensible space – room for the fire department to isolate a fire. Close to surrounding buildings – attached or nearby structures like garages increase risk. Close to natural fuels – if you have dense trees or grasses nearby, having them trimmed at least 100 feet away from your house reduces the risk. Fuel tanks within 30 feet – tanks like propane and oil heating fuel near the structure are higher risk. Gas powered machines stored near house – lawnmowers, snow blowers, outboard motors, dirt bikes, etc.. Accumulated yard debris – grass clippings, leaves, and tree limbs left near the home. Firewood stored under deck or eaves – nearby dry, combustible wood is convenient, but adds fire risk. Open burning yard debris and trash – if you burn, a burn barrel used at least 30 feet from structures reduces risk. No house numbers displayed – easier to find is better for the fire department. Unregistered house number – rural houses may not have home mail delivery or registered house numbers, making them even harder to find. Unattended cooking – the biggest risk factor of all. Age and maintenance – of space heater. Incorrect usage – of space heater, or too close to combustibles. Inadequate ventilation – for non-electrical space heaters. Presence of of children – around space heater. Electrical overload – residents may compensate for an inadequate electrical system by running extension cords and placing increased demand on the remaining electrical outlets. Smoking – careless smoking is the fourth highest unintentional cause of home fires. Alcohol and drug abuse – intoxicated people are at high risk, especially those that smoke indoors. Prescription drugs – drugs with strong side effects have risks similar to intoxication. Candles – a significant cause of fire. Children – under age 10 raise the risk of a fire due to carelessness or curiosity about fire without understanding the danger. Playing with fire is a significant cause of fire. Elderly – over age 70, an individual’s risk of dying in a fire caused by negligence increases dramatically. Everyday activities like cooking are more dangerous if a person’s physical or mental capabilities decline, or for those on strong medications that make them less alert. Mobility, cognitive, or sensory impairment – for much the same reasons as intoxication. Parental presence – households where children are left unattended have higher risk. If an adult is home at the time there is still a large risk posed by unattended children, especially if there are no working smoke alarms. Single parent families – have only one income, and less flexibility to deal with household and child care contingencies. Children may be left unattended more often. Living alone – people who live alone have higher risk. High occupancy – the more crowded the living conditions, the higher the risk. Vacancy – the more the home is unoccupied the higher the risk of fire. Lower income -increases risk, possibly due to limited funds for professionally maintained heating and cooking systems. Section 8 households are somewhat of a statistical exception as the apartments are inspected annually. Lower levels of education – are linked to higher fire risk. Male resident – males have higher risk than females. Non-Caucasian – Caucasian have the lowest risk of all races. Social deprivation – reclusive people have higher risk of fire. Manufacturers make lots of claims and assumptions about the conditions in a home fire to brag about how they’re protecting you. Lets look at some real data. The NFPA tallied the results from the U.S. Fire Administration’s (USFA’s) National Fire Incident Reporting System (NFIRS) and the National Fire Protection Association’s (NFPA’s) annual fire department experience survey and came up with the following data. 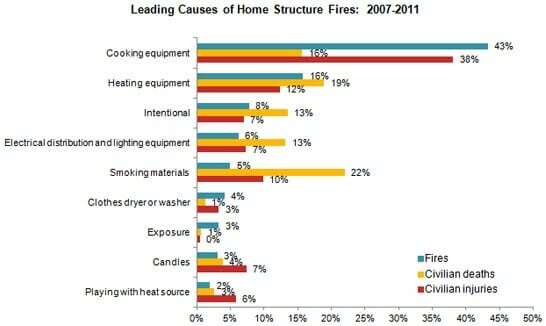 The vast majority of home fires are caused by cooking, about 2.7X more than the next highest cause. Cooking fires include fires caused by stoves, ovens, fixed and portable warming units and hot plates, deep fat fryers, and grills. Other than cooking, unintentional home fire are causes are heating equipment, electrical and lighting, smoking, forest fires, candles, and playing with fire. Arson is the third highest cause. The kitchen is by far the highest risk area in your home for a fire, 6X higher than the next highest area. The next most likely sources are bedroom, chimney, living room/family room/den, laundry room, attic/crawl space, and outside your house. Notably attached garages aren’t included on the chart although they are generally a higher risk area. That may be because single- and multi-family homes, apartments, condos, and other residencies are included in the data. Only a small proportion of these have attached residential garages. How hot does a typical home fire get? Lets take a look. 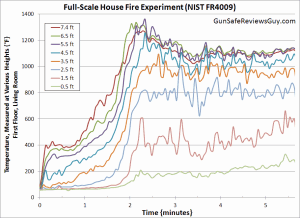 A full-scale home fire test (PDF link) was done by the National Institute of Standards and Technology (NIST) to test the conditions inside a real home fire. The house used for the experiment was an unoccupied two story single family home with four bedrooms and two bathrooms. The house was wood framed with wood clapboard exterior and pitched asphalt shingled roof. The interior had gypsum drywall (Sheetrock) interior walls and ceilings except for two walls in the living room which had laminated pine wood paneling. The whole house had hardwood floors except the vinyl floors in the kitchen and bathrooms. There was a full basement, but it did not extend under the attached garage. Sounds like a pretty typical American home. Sensors were set up to measure the temperature at different heights off the floor in the first floor living room and dining room. Then a fire was started in the living room. You can see that the temperature in the first floor at eye level hits 1200 °F in about two minutes! The temperature only 1.5 feet off the floor is at 600 °F within 6 minutes. For this experiment they set off a fire suppression system about 6 minutes after starting the fire, so this is all the data from this test. Is this test representative of a gun safe? 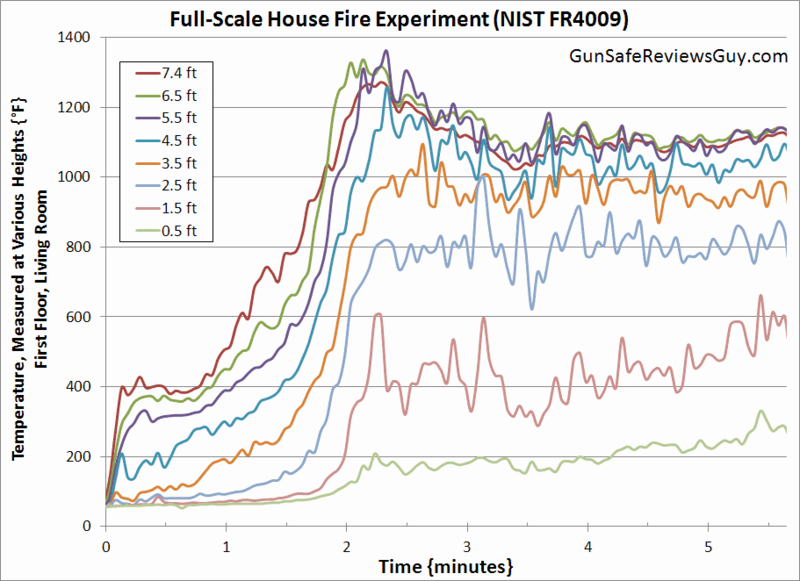 The FR 4009 fire in this test was started in the living room, which is over 10X less likely than the kitchen. However, many homes have adjacent kitchens and living rooms, often with open floor plans. So a kitchen fire could quickly be in the living room, and the living room is a popular location for gun safes. Bedrooms are also a popular location for gun safes, and the second most likely origin of fire. So, it is likely that a gun safe would be located in the same room where a fire started. Regardless, temperatures in the adjacent dining room during the test were very similar so I didn’t include them in the chart. Given these facts, I think it’s reasonably representative. In a home fire, temperatures get really hot, really quickly. Within a few minutes your gun safe may see 1300 °F depending on where it is. A fire protection test that ramps up over a long period is not representative of a real fire. The top of your fire safe will have to deal with much hotter temperatures than the bottom. You can see this in the burn patterns on gun safes that have survived fires. In a fire, the second floor of your house is going to get hotter than the first. In the plot above, the temperature peaks around 1300 °F and starts to fall again. 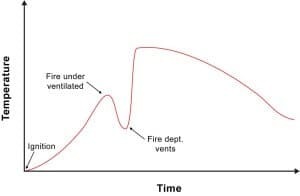 This appears to match the characteristics of a ventilation limited fire (see graph). In other words, this fire was starved for air. Once the fire department ventilated the fire, or the fire burned through a wall or window and got more oxygen, the temperature would actually get much hotter. People in the western states and wooded areas also need to be concerned about forest fires. In a forest fire, the temperature on the forest floor can reach 1,470°F, with hotter and hotter temperatures the higher you are off the ground. Not only do these fires burn hotter than many single home structure fires, but they also burn longer. The fire departments will generally be focused on slowing the spread of the fire and protecting entire communities, not putting out individual home fires. So no one may come to fight your fire at all. After your home and the surrounding trees burn to the ground the area will still be hot and inaccessible, so the fire safe will roast in the heat of the ember piles before firefighters are able to move in and extinguish what’s left. Based on this information, the UL 72 temperature curve looks realistic, probably why the NFPA adopted a similar standard NFPA 75. Assuming a home fire is not limited by fuel, heat, or oxygen, a typical house fire will double in size every single minute. There is a lot of variability to home fire duration and fire response. A home in my high school rival town, located directly across the street from the fire station, burned to the ground! This last point is especially of interest to gun owners. Ammunition rounds cooking off in a burning home will slow down firefighting. When a round cooks off in the open, there’s no barrel to build up pressure. The bullet is the heaviest part of the cartridge and it may only move a foot or two, but the brass casing will explode sending fragments flying. The fire department’s number one priority in a fire is the safety of people. If there’s no one left in the house to rescue, there’s no reason to risk a fireman’s safety unnecessarily if ammunition is cooking off. You’re not going to be able to convince them to run inside the house and risk injury because your fire safe only has a 30 minute rating.